Next we move onto how we use the generated classes in the post below to develop a hibernate application that demonstrates many to one bidirectional relationship. We have a little bit of spring but the highlight is to demonstrate hibernate capabilities. I have put most of the jars in http://cuppajavamattiz.com/2008/06/14/migrating-to-a-standalone-spring-hibernate-application/ example on the classpath with a minor change. In addition I have added \spring-framework-2.5.4-with-dependencies\spring-framework-2.5.4\lib\cglib\cglib-nodep-2.1_3.jar also on the classpath. Note the lazy=false in both hibernate mapping files at two locations by which we enforce eager fetch. System.out.println("Inserted Book, ISBN, Title:  "
System.out.println("Inserted Author, First and last name:  "
+ contributingAuthor.getFirstName() + " "
This post is related to the discussion on hibernate mappings below. To take the discussion forward I have created two projects and I shall be dealing with each project in two separate posts. 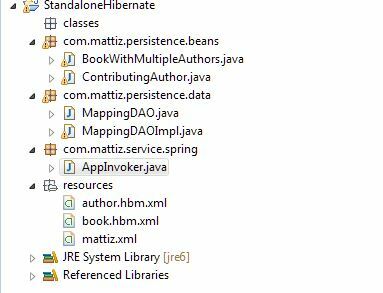 This post is related to how the hbm2java task creates domain objects mapped to the database on the fly, from hbm.xml files. Author.book_id is foreign key from Book. In the many-to-one tag the name is “book”, so that means that if you use a getter it would be author.getBook() or if you use HQL author.book. If author in book is many-to-one, book to author is one- to-many and is a set. The FK to author is the primary key in book. in book.hbm.xml. Here the key book_id is in the other table, i.e. Author. So getAuthors() will use the book_id column (FK) in the Author table. So Author has PK author_id and FK book_id while Book has PK book_id. This relationship gets the authors (looked up based on FK book_id) associated with that Book. So authors are looked up based on their FK which is book_id and you get multiple authors which is a set. Basically in a one to many the key has to be in the other table. The underlying table structure has to match hibernate’s definition else it will give you a runtime exception. it means refer to the key in the table where it is an FK. select * from t_book where book_id = ? where the parameter in the last query would be from the author table; which would return one (obviously) since you are querying by PK. A unidirectional one-to-one association on a foreign key is almost identical. The only difference is the column unique constraint. Of course the underlying table structure has to match hibernate’s definition else it will give you a runtime exception. 2. The other option is to have a PK FK relationship but uniqueness enforced on the FK – so there will only be one. • cascade=”none” means that if saving or deleting first hibernate object has no affect on related objects. • cascade=”save” means if first object is saved it automatically saves related objects. • Similarly cascade = “delete” will delete related objects. • cascade=”all” will save, delete, etc related objects even if they have FK constraints. Everything gets deleted, and hibernate takes care of that.